Which Star Wars™ Characters Can I Find as Hallmark Keepsake Ornaments? This year, with the unveiling of the 2012 Hallmark ornaments continues a long-standing tradition — the Star Wars™ Hallmark ornaments series with collectible Star Wars™ Hallmark Keepsake Ornaments. Hallmark® Cards, Inc. has an exclusive contract with Lucas Film, LTD for the production of Christmas ornaments depicting Star Wars™ characters and vehicles. They have been making Star Wars™ Hallmark ornaments beginning with the release of the 1996 Millennium Falcon, and some of their creations have become classics with Star Wars enthusiasts. Early favorites like the At-At, X-Wing Starfighter, and TIE Fighters from Star Wars™ are now rare and collectible, though they are still obtainable through ornament dealers, such as The Ornament Factory, in limited quantities. Other iconic Star Wars™ vehicles and structures have appeared through the years, such as the 2002 Death Star, and the 2004 Star Destroyer – which were also made available together, on a smaller scale, with the release of the 2008 Death Star and Star Destroyer miniature ornament set. These will always be huge favorites and are still available today. 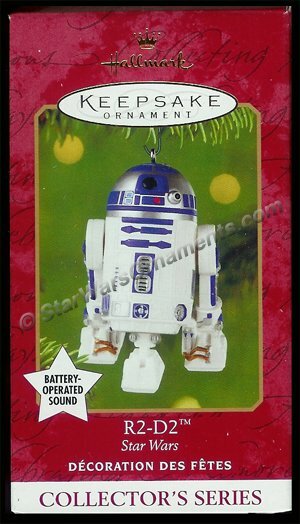 C-3PO and R2-D2 were issued as a set of miniature Hallmark ornaments in 1997. Full sized versions of these two iconic droids were released in later years, first with the release of the 2001 R2-D2 (which is #5 in the official Star Wars Hallmark ornament series), followed by the production of the 2003 C-3PO (#7 in the series). They are still available and continue to enjoy a position of prominence in the collection. Oddly enough, Han Solo and Chewbacca were not some of the first Star Wars™ characters issued. This omission was corrected in 1999 with the introduction of the Han Solo and Chewbacca Christmas ornaments. These became immediate fan favorites. In fact, these two characters have been so popular with fans that there has been two additional Han Solo ornaments released since the original ornament was released in 1999 (2009 Han Solo in Imperial Stormtrooper armor, and 2012 Han Solo to the Rescue), and an additional Chewbacca ornament released in 2004 (2004 Chewbacca and C-3P0). As the Star Wars™ saga went on, so did their ornament collection. Other notable favorites are the 1997 Yoda, 2004 Anakin Skywalker, and 2007 R2-D2 and Jawa. 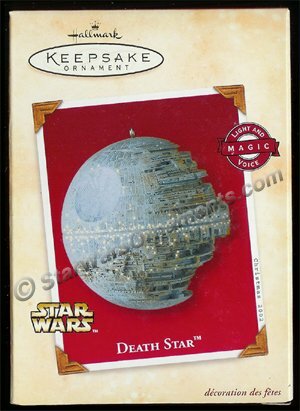 However, some of the most popular and collectible Star Wars Hallmark ornaments were only sold in limited quantity, such as the 2007 Tusken Raider, 2008 Emperor’s Royal Guard (you know, the guys wearing all red that protected the Emperor), and the 2009 Greedo ornament. 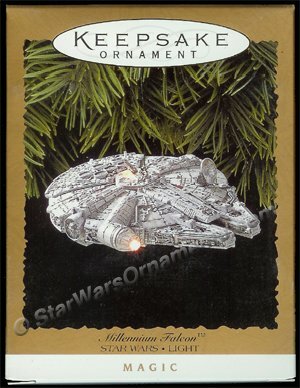 Still, there were some even more difficult to find, and highly collectible Star Wars ornaments that were never even in a Hallmark Gold Crown store! These ornaments are released in extremely limited numbers, and are only available at special events, such as the San Diego Comic Convention (San Diego ComicCon, or SDCC), or at the Star Wars Celebration events. Some of these rare and valuable ornaments include the 2009 Shock Trooper and Shadow Trooper set, which sells for over $500 today, the 2010 K-3PO and R-3PO set, and the latest of these very popular ornament sets, the 2012 Obi Wan Kenobi and Ponda Baba set, which was exclusively available at the Star Wars Celebration VI event, which features the scene from Chalmun’s Cantina on Tatooine where Obi-Wan uses his lightsaber to cut off Ponda’s arm. The best part is – the severed arm is actually a third ornament in this set! Of course, Hallmark has continued with this great tradition of producing numerous Star Wars ornaments this year. 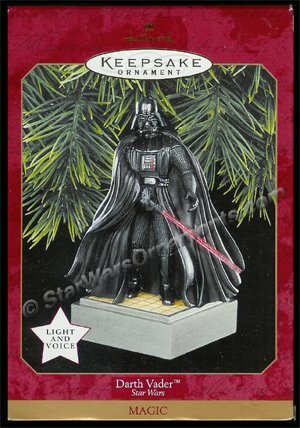 The 2012 Hallmark ornaments include a Darth Vader “Peekbuster” ornament, which has the Dark Lord wearing a Santa hat and speaking dire warnings to those who would peek at their Christmas presents. Momaw Nadon, who was last seen in the Cantina on Tatooine, was released as a limited quantity ornament. Sith Apprentice Darth Maul is ready for action this year, posed for battle with his unique lightsaber. The vehicle for 2012 is the TIE Interceptor – a variation of the TIE Fighter, as seen in Star Wars – Return of the Jedi. 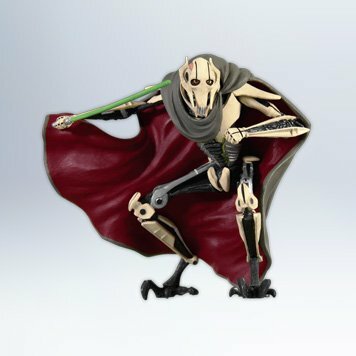 The evil General Grievous (#16 in the Hallmark Star Wars ornament series) finally makes an appearance, rounding out the ornament selection. To secure your 2018 Hallmark Keepsake ornaments (or any other ornaments that you may have missed from prior years) for your Christmas tree this holiday season, be sure to go to The Ornament Factory or by calling The Ornament Factory at 1-888-740-6970. May the Force be with you – and Happy Collecting! As I am sure many collectors have heard by now, the licensing agreement between Mattel and Hallmark expires at the end of 2012 (Note: thankfully it was restored in 2015), and so many popular Hallmark Ornament series, such as Barbie, Fisher Price, Hot Wheels, and G.I. Joe will come to an end this year. We have spoken to quite a few Barbie ornament collectors, and needless to say, they are very disappointed. However, I don’t believe that the true impact of this news will be felt until the 2013 Dream Book is released and collectors see the gaping hole left in the 2013 Hallmark ornament collection by the absence of Barbie. Although many of the Mattel ornaments have been very popular over the years, especially the Fisher Price ornaments, which began with the 2007 Play Family Farm and 2007 See N Say ornaments, the ornaments that will be missed most by Hallmark ornament collectors will the long running Barbie Hallmark ornament series. In fact, since 1993, Hallmark has produced over 200 different Barbie ornaments! The Barbie Hallmark Ornaments began back in 1993 with the release of Holiday Barbie #1. Even today, this is a very popular ornament with collectors, and has held its value better than any of the other Holiday Barbie ornaments. With her beautiful red gown and flowing blonde hair, it’s no wonder that this Barbie ornament has remained so popular with collectors for so long. 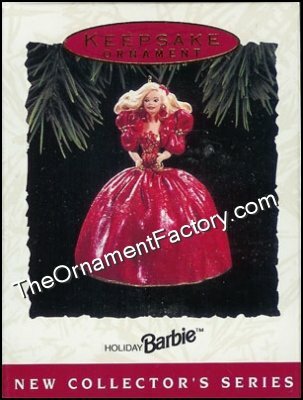 The Holiday Barbie Hallmark Ornament series ran from 1993 through 1998, ending with 1988 Holiday Barbie #6. 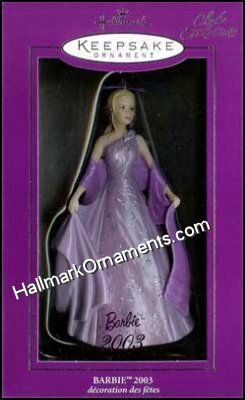 Although the Holiday Barbie series officially ended in 1998, Hallmark then released the 1999 Millennium Princess Barbie ornament, which seemed to compliment the series, and then started the Celebration Barbie series in 2000. Many collectors feel as though the Celebration Barbie series is just a continuation of the Holiday Barbie series since the style of these Barbie ornaments so closely mirror each other. Unfortunately, the Celebration Barbie Hallmark Ornament series will end this year with 2012 Celebration Barbie #13, which will be released during the October 2012 Hallmark Ornament Debut event on October 7th. Many collectors feel as though the 2012 Celebration Barbie will be the crown jewel of the Celebration Barbie series, as Barbie looks absolutely amazing in her long, flowing crimson dress with white fur on the shoulders, long, white gloves, and beautiful blonde hair. 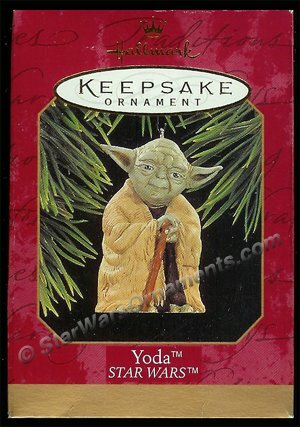 There is already a huge demand and waiting list for this ornament, and we anticipate that this ornament will skyrocket in value, possibly even before the end of the 2012 holiday season, and is already one of the most popular 2012 Hallmark Keepsake Ornaments, even though it has yet to be released. Of course, there have been numerous other, and very popular, Barbie Hallmark ornament series that have been produced over the years. The “official” Barbie ornament series began in 1994 with Barbie Debut, which featured a blonde Barbie in a one piece, black and white stripped swim suit. In 1995, Hallmark also released a club exclusive version of the 1994 Barbie #1 ornament, except this time, Barbie was a brunette. The Barbie Hallmark Ornament series, which is the longest running Barbie ornament series produced by Hallmark, has also continued through 2012, and will come to a conclusion with the 2012 Matinee Fashion Barbie, #19 in the series. Hallmark was also producing several other lines of Barbie ornaments that have been well embraced by Barbie ornament collectors over the years, including the Barbie Fashion Model collection. Anther line that has picked up popularity in recent years has been the Barbie ornaments produced for the current “Barbie movie”, which has especially caught on with younger Barbie ornament collectors. The most popular series of Barbie ornaments with collectors has been the very limited Barbie Club Ornament series. All of these Barbie ornaments are made of porcelain, and are exclusively available to Hallmark Keepsake Ornament Collectors Club members since 2000. These Hallmark Barbie ornaments are beautifully sculpted, and have many more fine details than the regular issue Barbie ornaments. Not only are these Hallmark Keepsake Ornaments made of porcelain, but many of them also have real fabric accents and some of the most exquisite dresses that you’ll find on a Barbie ornament. Over the years, due to the high popularity of these club exclusive ornaments, many of these pieces have become increasingly difficult to find, and so the prices on many of these ornaments continues to sky rocket. Many avid and loyal Hallmark ornament collectors are very disappointed to see the Barbie ornament series come to an end, especially so suddenly. Hopefully, at some point in the future, Hallmark and Mattel may be able to work out some sort of deal that would allow Hallmark to continue producing ornaments, if not with all of Mattel’s properties, then maybe only Barbie ornaments. (Note: as we were hopeful, Hallmark and Mattel were able to renew their licensing agreement in 2015). I am anticipating quite an uproar from Hallmark Ornament collectors at some point in the future. Maybe not this year, but when the 2013 Dream Book seems to be missing a couple pages of 2013 Hallmark Ornaments that would normally be filled with the latest Barbie treasures and additions for their Christmas trees, I would anticipate quite a few letters and phone calls will be made by all of those that will feel that part of Christmas is missing. Here is hoping that something can be done in the near future to bring Barbie back to our Christmas trees with only the quality that Hallmark can provide. Until then, next year may be a good time to fill in any missing pieces that you may have in your Barbie collection. 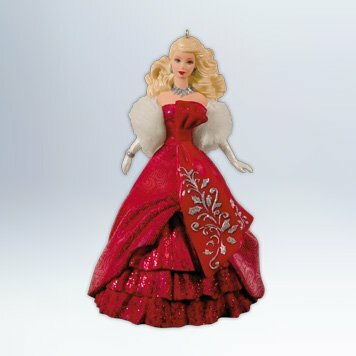 Here is a link to all of the Barbie ornaments that are available at The Ornament Factory (www.hallmarkornaments.com).